he north side of the loch is dominated by Ben Lawers. 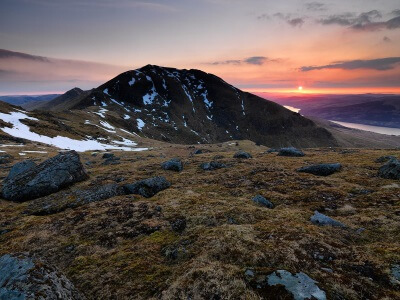 At 3,984 feet, it is Perthshire's tallest mountain but a maddening 16 feet short of joining the expanding number of Scottish peaks - now nine - over 4,000 feet. It was up there with them once. In the nineteenth century a patriotic son of Perthshire, Malcolm Ferguson, raised a 16 foot-high cairn on the peak. But the frost and winter blizzards that sweep the high tops between here and Loch Rannoch have ground off all but a small scatter of stones. Lawers is a remarkable hill, in summer only a bracing walk to climb. Its complex Alpine flora, unique in Scotland, only just survived the Victorian plant collectors. On a clear day from its summit you can see Arthur's Seat to the east and Ailsa Craig off Ayrshire to the west and, of course, Ben Nevis. 'Cuimhnichibh na Doine o'n d'thainig sibh' (Remember the men from whom you have come) is the Gaelic tag carved on the statue of David Stewart at Keltneyburn. The lives of the many thousands of people whose remains fill the little burial grounds scattered across this, their country, were hard and dangerous compared with ours but filled with a rich culture of poetry, music and a spirituality that flourished here for a thousand years. Few descendants of those countless generations are left in these straths and even fewer retain the link to the land. But, just as their landscape was created by their Pictish predecessors, so the Gaels have bequeathed theirs to us. We should honour them and remember them. Perhaps our successors will accord us the same recognition.